Direct the cars as fast as possible, making sure to pull all broken down cars off the roadways and keeping the crazy drivers from crashing. 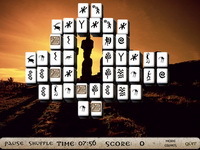 Free mahjong game in ancient theme. Stone giants Moai have always fascinated with their grandeur, incomprehensible, mysterious. We can only guess about the secrets to creating the figures and suggest playing the mahjong based on the mysterious of the islanders. Wheely 2 is the sequel to the great physics game Wheely. Your job is to help our car friends reach their targets.